Kate Ashbrook: today Wales; tomorrow England? A leading campaigner said she fears for the future of Welsh footpaths if Government proposals go ahead. Kate Ashbrook said the approach could spread to England if cash-strapped authorities adopt the same view. 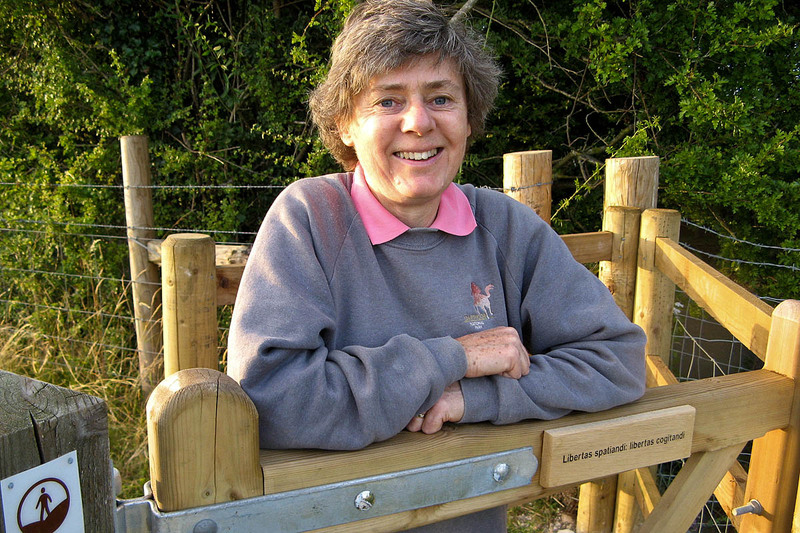 Ms Ashbrook, a veteran access advocate and general secretary of the Open Spaces Society, said the Welsh Government’s is dismissing the historic and cultural value of public paths – a trend that could cross the border to England. The OSS, Britain’s oldest national conservation body, has responded to a green paper published by the Cardiff administration. Ms Ashbrook points out in her editorial in the society’s latest magazine that Wales’s economy is heavily dependent on tourism, much of it in the outdoors sector. She said: “Despite positive statements in the paper about the importance of recreation, the Government sees only burdens and costs in the public-path network, and in effect dismisses this great heritage. “It proposes that local authorities review ‘the opportunities available within their area for access and outdoor recreation and confirm a prioritised network of recreational routes and access areas’. “We know what this means. National trails and a few promoted routes get top treatment while many others go to the bottom of the heap. “The paper offers the carrot of Scottish-style access – the freedom to walk everywhere subject to a code – but this would be at the expense of public paths: definitive maps would no longer be a definitive record and highways would be put in a hierarchy and moved at whim. “If this happens in Wales now, it will happen in England tomorrow where local authorities suffering from government cuts are desperate to save money. I now live in Scotland, and have been extremely disheartened by the lack of genuine access. Most people, away the main trails, walk on roads and tracks. The access law is theoretically great, but without a network of footpaths to access the land in the first place it is useless in practical terms. Without a definitive map to give you a clue about accessing new places, it's hard to know where to even start. The footpaths in England and Wales are precious jewels. It is so disappointing that Scotland is so comparatively hard to access. Since moving here I feel that I have lost something fundamental. Please don't let the same thing happen in the south of Britain. We seem to lag behind many EU countries who mark paths with colour coded bars on trees/rocks/ ,it is so easy and obvious so that even without a map people can feel confident to set out. Obviously the first pre-requisite is to have paths!! I find the cross country challenge of Scotland rewarding. To pick a route of a map and then lead the rout, great. More often then not, if you pick the route of least resistance, you find others have and there is already a path. We need more volunteers to help maintain the paths in the UK, there simply isn't the funding at the present, for right or wrong. I am a volunteer ranger and in our area we do much for the paths, which are primarily a problem due to lack of use. Take up the slack, its the only way. Sad but true. I've walked in Scotland for over 30 years and find the lack of paths no problem. Access is very easy, if you want to walk somewhere, just go as long as your not making a nuisance of yourself , simple! I love walking in other parts of the UK too but if I'm honest I often find the system of paths too restrictive in the way they often herd people sometimes making finding peace and quiet a bit more difficult to find.